Assistance League was formed by compassionate women who came together to make a difference in their communities. It was the first nonprofit, nonpolitical, nonsectarian organization founded in the West to recognize the potential of volunteers in helping those less fortunate to achieve a better, more meaningful life. 1894 – Los Angeles society ladies including Anne (Mrs. Hancock) Banning start an informal charity they call Assistance League because they wish to be of assistance to anyone in need. Committees are formed and they hold a variety of fund raising events including teas, musical evenings and an annual charity ball. This group continues through the turn of the century. 1906 – In response to the San Francisco Earthquake and Firestorm, Anne Banning asks her Assistance League friends, now including Ada (Mrs. Homer II) Laughlin, to meet at her home to sew children’s clothing and collect money that will be sent to the victims in San Francisco. 1917 – Anne Banning and her Assistance League ladies organize the Red Cross Shop in Los Angeles during World War I. 1919 – Anne Banning and Ada Laughlin organize Assistance League of Southern California to provide help to returning veterans and new residents of Hollywood. Good Samaritan was the first service and Film Location Bureau (renting private homes for the movie industry) the first revenue source. 1935 – As women in adjacent communities express their desire to become Assistance League chapters, National Assistance League is formed. The San Pedro group is the first new chapter chartered. By 1948, when Anne and Ada retired as President and Vice President of Assistance League, there are 10 chapters in National Assistance League. Assistance League of Phoenix was organized as Assistance Guild of Phoenix in 1960. It was incorporated as a nonprofit organization in March 22, 1961 and chartered March 15, 1966 as the 36th chapter of National Assistance League®. 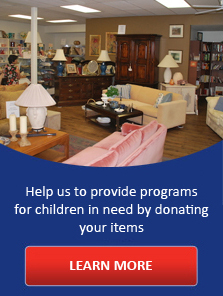 From the beginning, a resale shop has been an important part of the fundraising activities. The current Thrift Shop, considered by many to be the best thrift shop in the Valley, is located at 7044 N. 7th St. and provides about one-third of the organization’s funding. Following are the current philanthropic programs and the dates they were established. Schools. Our primary partners are the schools. For Operation School Bell, school personnel (usually social workers) who are familiar with the economic circumstances of the families select the children to be outfitted. They also either bring the children to our facility or they pick up bagged clothing for the children. They also attend a briefing at the start of the school year and evaluate the program at year-end. Other community organizations. In addition to partnering with the schools, Assistance League of Phoenix also collaborates with the Phoenix Fire Department, John C. Lincoln Dental Clinic, the West Valley Crisis Center and other community agencies. Community Volunteers. We also collaborate with numerous companies who send their employees to help with outfitting children or preparing inventory. Desert Schools Federal Credit Union, Bashas’ Food City, and hardison/downey Construction, Inc. are among the regular volunteers. Corporate donors are invited to encourage their employees to volunteer in Operation School Bell.